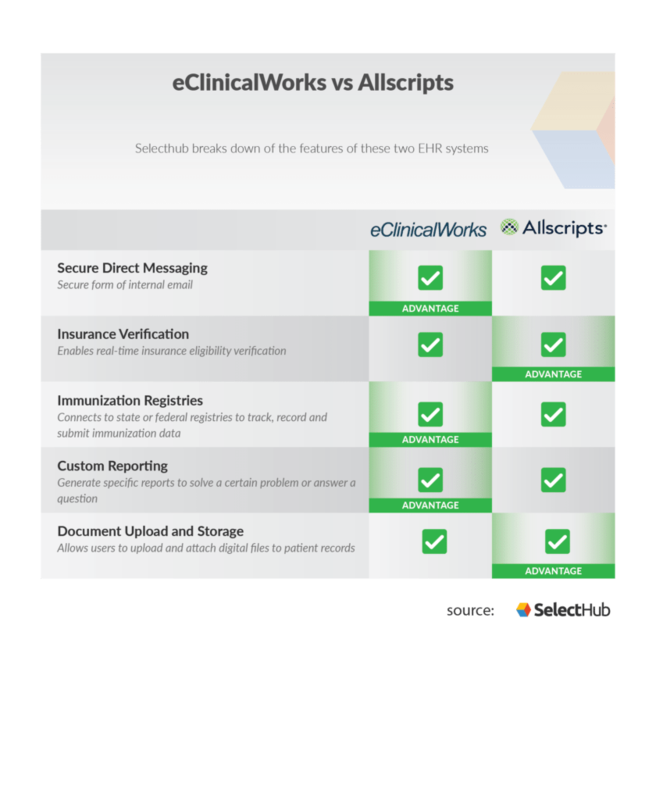 eClinicalWorks vs Allscripts - EHR Tools Comparison - Which is Better? So what kind of software do you need? There are practice management solutions, electronic medical records software (EMRs) and electronic health records (EHRs) software. If you’re not sure what the difference is, here are some articles to help you find out what you need. eClinicalWorks vs Allscripts are both powerful and popular options. We wanted to know how they measure up against each other, so we did some research using a feature-comparison algorithm. Here’s what we found. The EHR from eClinicalWorks is an award-winning EHR system designed to streamline the workflows for healthcare providers in small to mid-sized practices. It’s designed and distributed by eClinicalWorks LLC, a company that has emerged as the industry leader in the development of medical software solutions. This platform is highly acclaimed for its capabilities of prioritizing customers and making usability and customer satisfactions easy. With 30 years of experience on their side, Allscripts is a leading EHR solution. Allscripts has grown its portfolio suite and services into a leader in population health and precision medicine. This system provides its clients with an application store with the latest industry solutions. From care coordination to analytics to other innovative technology applications, Allscripts can meet almost any need a small to mid-sized practice may have. Direct secure messaging is a national encryption standard for securely exchanging clinical healthcare data via the Internet.It specifies the secure, scalable and standards-based method for the exchange of Protected Health Information (PHI). It was developed in 2010 under a part of a federal project for standards-based healthcare communications. As a part of qualifying for incentive payments under the Meaningful Use Stage 2 criteria issued by the Office of the National Coordinator for Health IT (ONC), healthcare organizations and providers must meet data transfer requirements using Direct Messaging. This feature provides secure internal communication channels between patients and physicians. With eClinicalWorks, users get a patient portal with a secure communication channel between physician and patients. The messenger is a closed-loop communication system that leverages the information in the EMR to connect with patients. The EHR from eClinicalWorks also provides a patient portal which is fully integrated with a Healow App. This helps patients access their patient portal account securely and manage their family’s healthcare anytime. A central eClinicalWorks Grid Cloud system is an ICD-10 compliant system. It includes search features to help providers find an ICD code with ease and provides private cloud handling on a national network of nine data centers to keep your data private. Allscripts TouchWorks provides user-friendly navigation that allows patients to securely manage their health. This solution has services for direct messaging with secure information exchange and message storage. Allscripts also offers a patient engagement platform called “Follow my Health” for giving patients access to their healthcare information. Allscripts TouchWorks’ patient portal ensures the connectivity of a health information exchange (HIE), combining the value of a personal health record with the power of a patient portal. Allscripts TouchWorks supports ICD-10 coding with significant benefits in terms of clinical documentation, quality management and ultimately improves the quality of care. Allscripts wins this category with powerful security precautions and an intuitive patient portal where patients can take their care into their own hands and interact with their physician easily and securely without having to schedule an in-person visit. Allscripts rates better than eClinicalWorks for secure direct messaging features in SelectHub's research & analysis of the two tools. It’s crucial that medical care providers understand the importance of insurance verification services in the healthcare industry. It plays a major role in a hospital’s claims denial management program. Successful billing depends on successful eligibility verification. Health insurance verification is all about the process of checking a patient’s active coverage with the insurance company and verifying the eligibility of his or her insurance claims. In order to avoid claim rejection, the verification process must be done before the patient is admitted into a hospital. Otherwise, it might lead to denials. Patients are ineligible for benefits when they provide wrong or outdated information or when their policies have been terminated or modified. A simple error can result in claim rejection or denial, so you have to be sure it is being done correctly. This tool helps ensure patients’ insurance eligibility before they come into your office, streamlining operations and preventing costly and frustrating mistakes. The eClinicalWorks 10e offers a patient management system and patient flow tools that track patient encounters from check-in to departure. Physicians get automated billing tools to help them get reimbursed by payers. The eClinicalWorks EHR has the capability to integrate with its partner Emdeon that helps insurance verification by checking patients’ insurance eligibility in advance. According to an MGMA report, 50 percent of medical claims are rejected due to insurance eligibility issues. The eClinicalWorks insurance eligibility team verifies the authorization and referral details of the patient. Then they inform the patient what copays or deductibles need to be paid prior to the visit. Get our Price Guide for EHR SoftwareAllscripts provides a set of core EHR resources: Professional EHR, Touchworks EHR and Acute Care EHR, which vary in size and offerings. However, all three provide information on payments, patient flow, lab results and more in easy, visual dashboards. 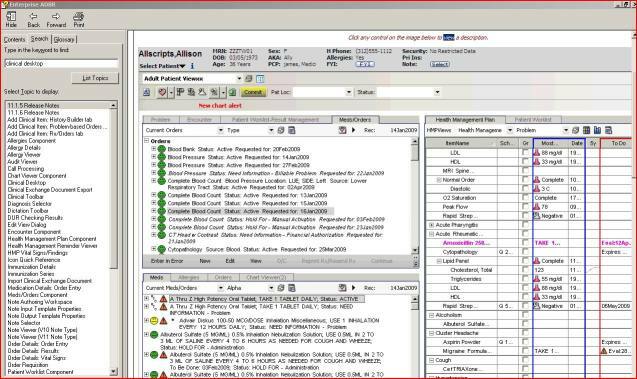 Allscripts TouchWorks (the enterprise solution) displays the patient’s insurance provider name, but this is read-only information. BillingParadise (one of the main RCM add-ons to Allscripts offered in the more comprehensive subscriptions) offers eligibility verification services to aid users in simplifying and streamlining the patient ingress process at your practice. eClinicalWorks EMR wins for this feature by providing interactive information displays and complete cycle management from check-in to departure at no additional fee. eClinicalWorks rates better than Allscripts for insurance verification in SelectHub's research & analysis of the two tools. Immunization registries are confidential, population-based, computerized information systems that attempt to collect vaccination data about all children within a geographic area. Registries are an important tool to increase and sustain high vaccination coverage of the general populace. The goal of these registries is to consolidate vaccination records of children from various providers, generate reminder and recall vaccination notices for each child, and provide official vaccination forms and vaccination coverage assessments. Immunization registries are state and federal databases that contain immunization records; whether or not an EHR integrates with them depends on the system. 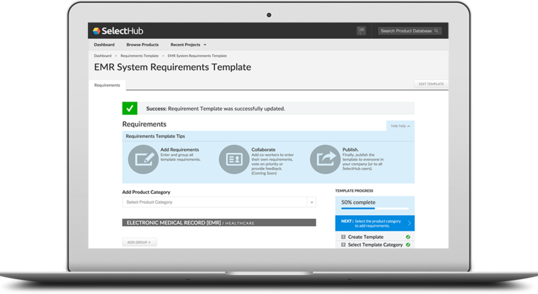 The set of software resources from eClinicalWorks is EHR Certified to provide for meaningful use compliance for stages one and two. Although eClinicalWorks provides immunization records, it does not support integration with federal or state registries. It is currently preparing to incorporate this functionality in order to comply with meaningful use regulations. Meaningful Use requires that practices demonstrate the capability to submit electronic data to immunization registries. Allscripts Version 11.2 has the ability to submit clinical data. Allscripts’ meaningful use dashboard offers an “anytime, anywhere” model makes it possible to download information from mobile devices. Allscripts TouchWorks has a user-friendly hover feature that highlights immunization details. Allscripts wins with its comprehensive display that can pull crucial information from national databases, saving patients and physicians time and, potentially, accidents. Allscripts rates better than eClinicalWorks for immunization registry capabilities in SelectHub's research & analysis of the two tools. A custom report is a report that users create. You pick the dimensions and metrics and decide how they should be displayed. Being able to customize the reports received from data can be particularly useful in a physician’s office, but some EHR applications offer more custom reporting options than others. The EHR from eClinicalWorks offers a population health management tool that analyzes inpatient/outpatient costs, along with pharmaceutical and DME costs. Practice leaders can see the total spent on any one area and make decisions about risky cost centers or how the practice relates to beneficiaries. 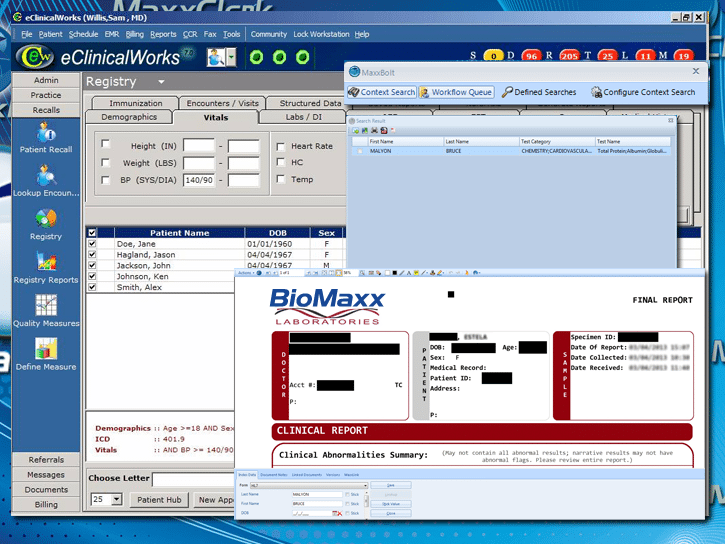 The eClinicalWorks EHR provides custom reports, but according to practitioners they are often incorrect or have bugs. Allscripts TouchWorks helps create and disseminate inclusive information to everyone for optimal financial and clinical outcomes. Within Allscripts’ menu of choices, certain features stand out. One notable example is the Noteswift application which works on the basis of Nuance Dragon speech-to-text software. This helps physicians automate things like Reasons for Visit, ICD-10 codes and CPT codes to speed up some of the paperwork processes done throughout the day. In addition, Allscripts offers various tools like E-Chart Courier for handling billing, RXInfo for looking at pharmaceutical information and eAuth for e-prescription workflows. A Sunrise Clinical and Revenue Cycle tool helps the practice look at finances. Allscripts wins with its robust suite for financial and workflow reporting capabilities. Allscripts rates better than eClinicalWorks for custom reporting features in SelectHub's research & analysis of the two tools. The EHR from eClinicalWorks is very useful in terms of documentation and is a feature practitioners report loving. V10 of eClinicalWorks is certified by the ONC and compliant with EHR technology certification. This is important in assisting practices with meeting meaningful use requirements for stage one and two, generally promoting the kinds of uses desired by government regulators in the age of digital healthcare. Allscripts TouchWorks provides document management with its partner “MaxxVault” which eases the uploading, scanning, indexing and searching of documents. Allscripts’ tools support clinical decision-making and connect doctors with payers. They help doctors look at lab results, medications and patient encounters on an “open and interoperable” platform. The eClinicalWorks EHR wins with picture and file attachment options and a rock-solid security protocol for all document upload capabilities. eClinicalWorks rates better than Allscripts for document upload and storage options in SelectHub's research & analysis of the two tools.